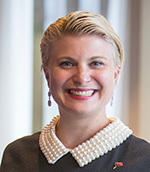 Tara Christianson started as a real estate agent in the Northern Virginia/Washington D.C. area in 2006. Since then, she’s shifted her focus to technology and training real estate agents in the United States, Australia and New Zealand, and is an internationally-known speaker, online strategist, trainer, and copywriter. One of her passions is keeping real estate agents safe in the real and online world through the use of technology. She is currently Century 21 Redwood Realty's Technology & Training Director and the Editor for Happy Grasshopper, while writing content and consulting for organizations such as NAR and the Real Estate Institute of Queensland.